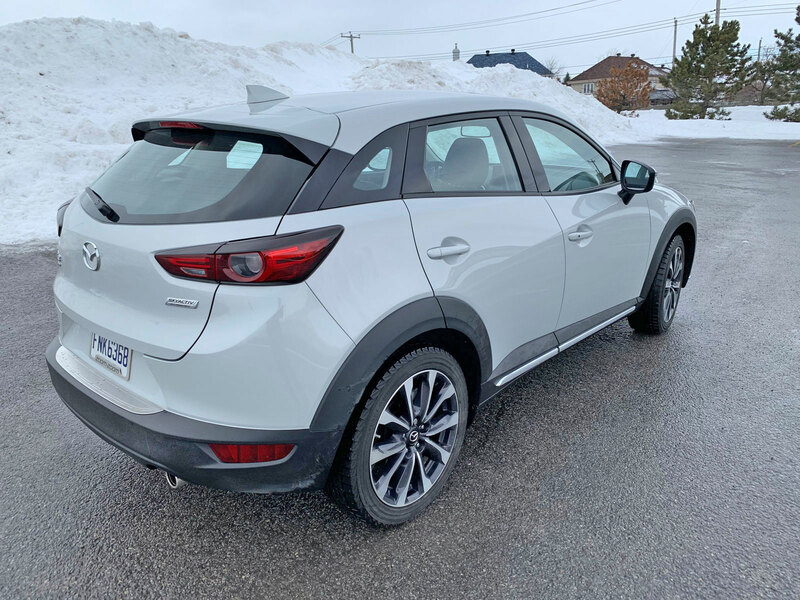 The Mazda CX-3 is a subcompact crossover sourced directly from the now-discontinued Mazda2. 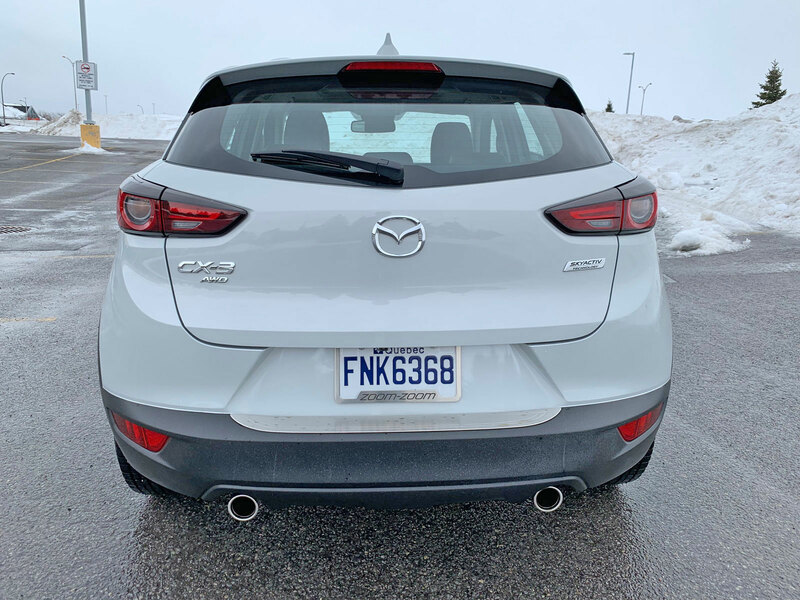 It actually looks so similar to its Mazda3 sibling that the untrained eye might not immediately be able to differentiate the two. But don’t worry, there are plenty of differences to separate it because it is, after all, considered a crossover or even an SUV though the latter term is really pushing the boundaries of what I’d consider one to be. Adding beefier fender flares, raising the ride height and complimenting that with available all-wheel-drive makes everything more interesting. It’s enough that the CX-3 obtains its own identity- one that fits well to cope with our rugged Canadian winters. 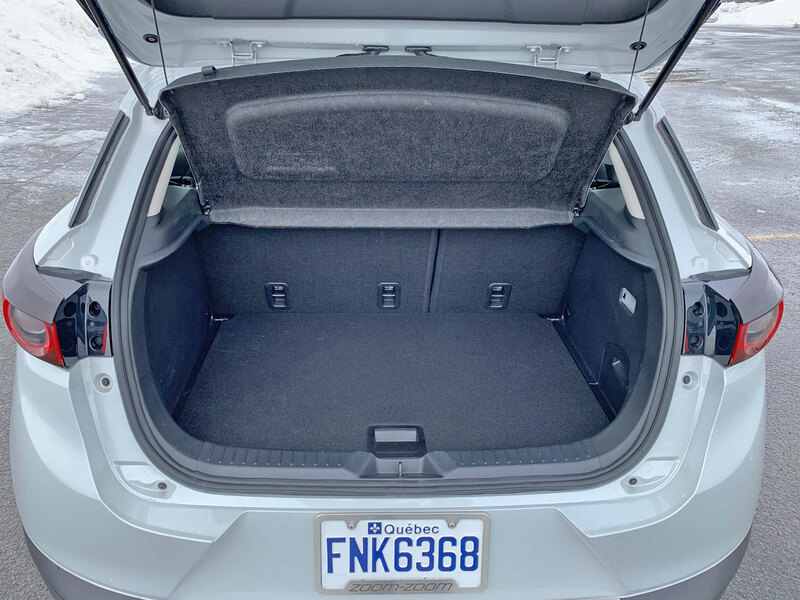 The vehicle has been tweaked for 2019 and now has blind-spot monitoring, tire pressure monitoring and a rear cross-traffic alert system as standard equipment. 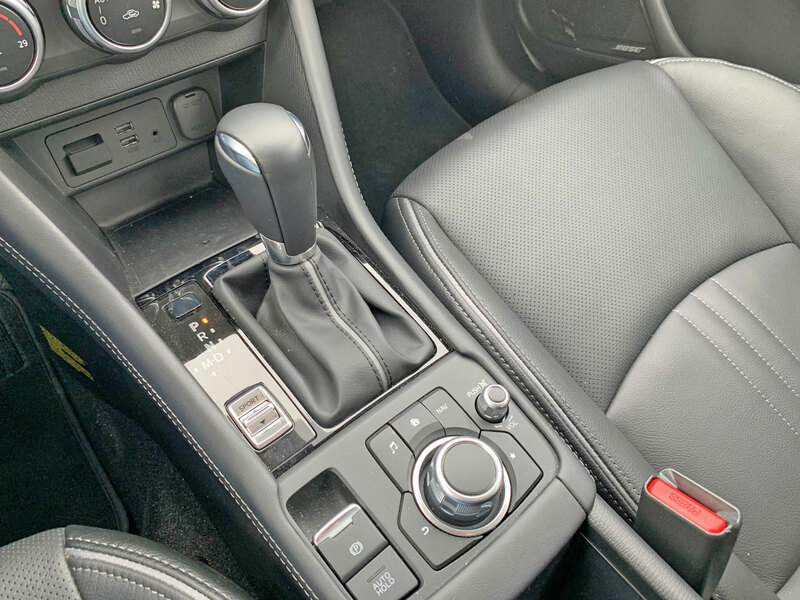 The center console has been redesigned and this GT version has an electronic parking brake that frees up space, new cabin materials, new full leather seats, new taillight design and new wheel options. 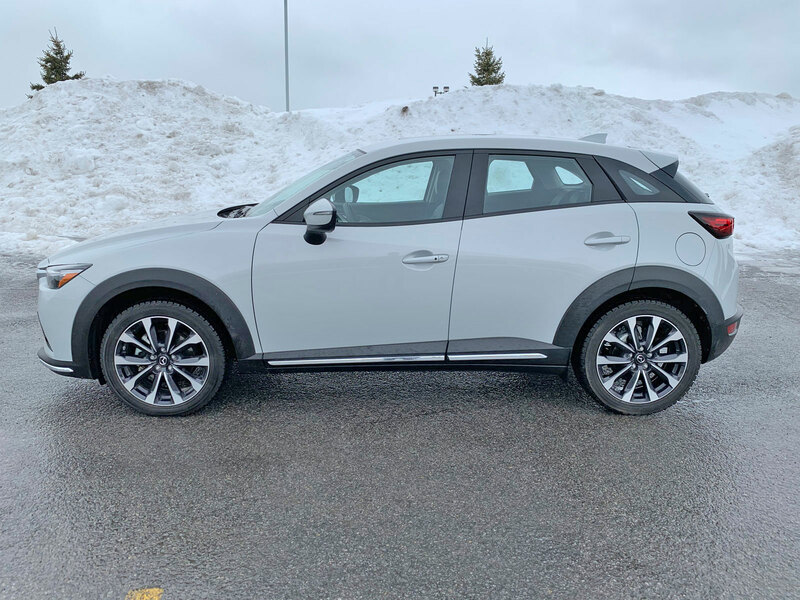 The CX-3 was a World Car Design of the Year finalist in 2019, lending credence to the brand’s KODO design language. It’s a clean, sharp and minimalistic aesthetic success. What immediately stands out though is how small the vehicle is. 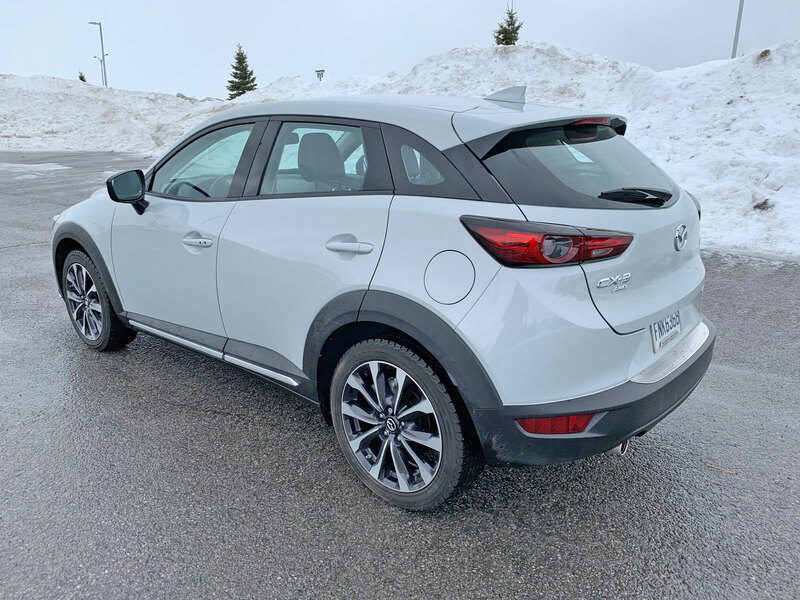 It’s smaller than most other sub-compact crossovers and I think this hurts the CX-3 somewhat. 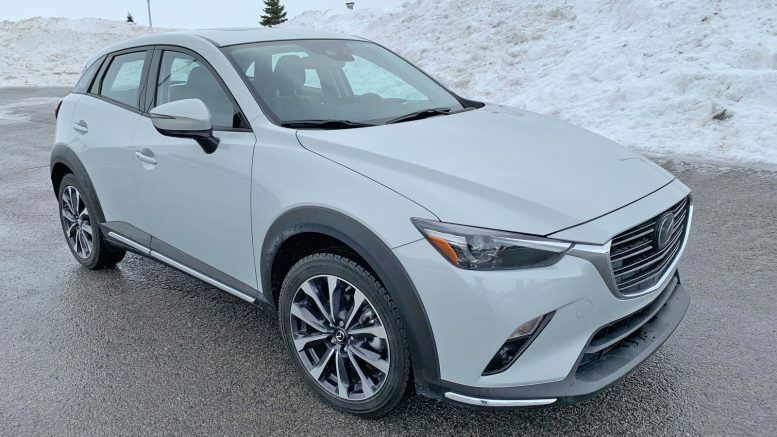 What’s a bit weird is that Mazda just announced a larger crossover called the CX-30 that is slated to fit between the sub-compact CX-3 and the compact CX-5. What they should have done is just make the new CX-30 replace the CX-3 but the brand feels there is a market for both. Fine. They have the all the focus group statistics so I’ll bite my tongue. 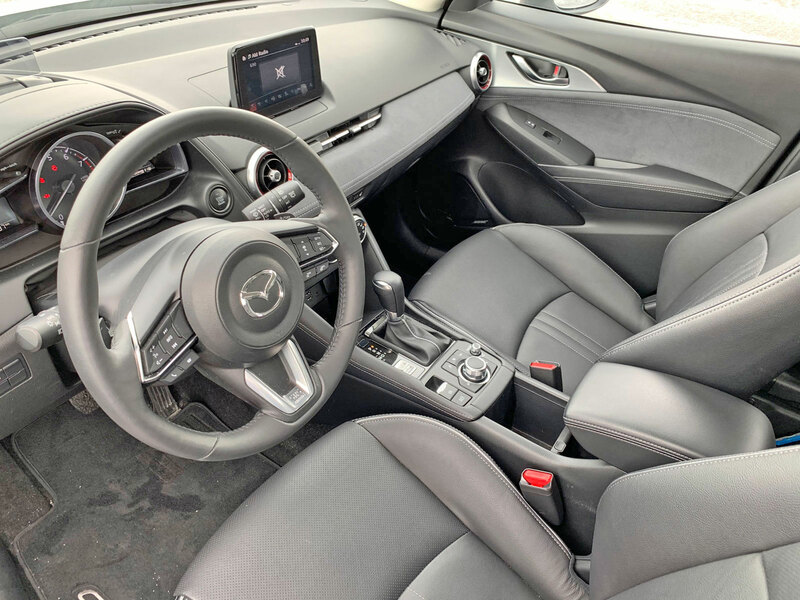 The interior of the CX-3 is a small place to be. Four adults will find it cramped but two adults and two children should find it passable. Where the CX-3 falls short in space, it makes up in intelligent design. 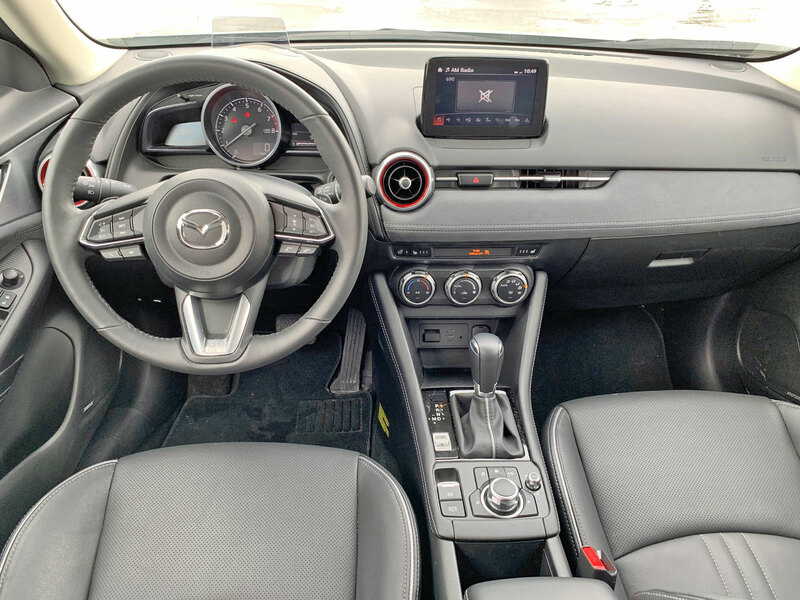 Mazda has done an excellent job with the layout of its interiors and I find they are underappreciated. Everything is right where is should be and well within arm’s reach. 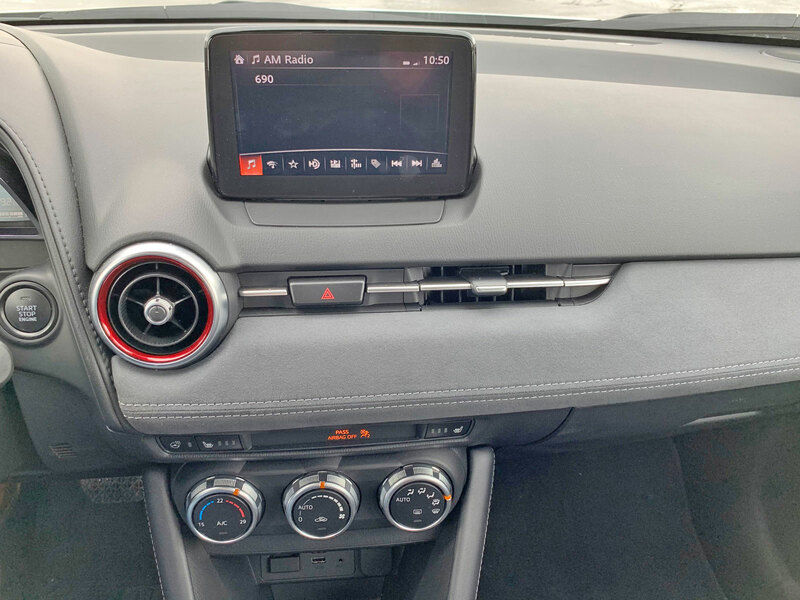 There are proper dials and knobs for climate and volume controls making basic vehicle operation a breeze. Only critical driver data is displayed on the instrument panel while entertainment data is relegated to the 7-inch infotainment screen. 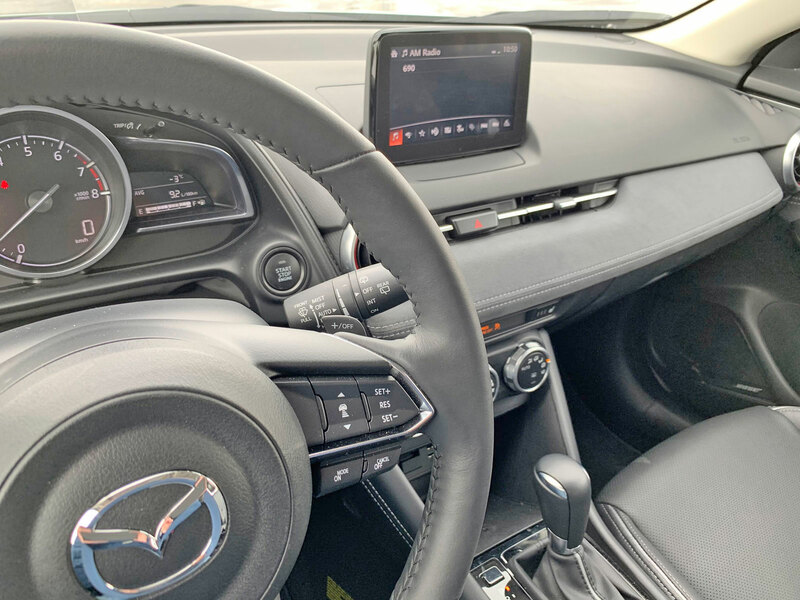 Mazda’s infotainment system is one of the best on the market. The Commander interface features a dial on the lower console where the driver can manipulate it without looking down. By far my favorite feature is the volume knob location next to this command wheel. 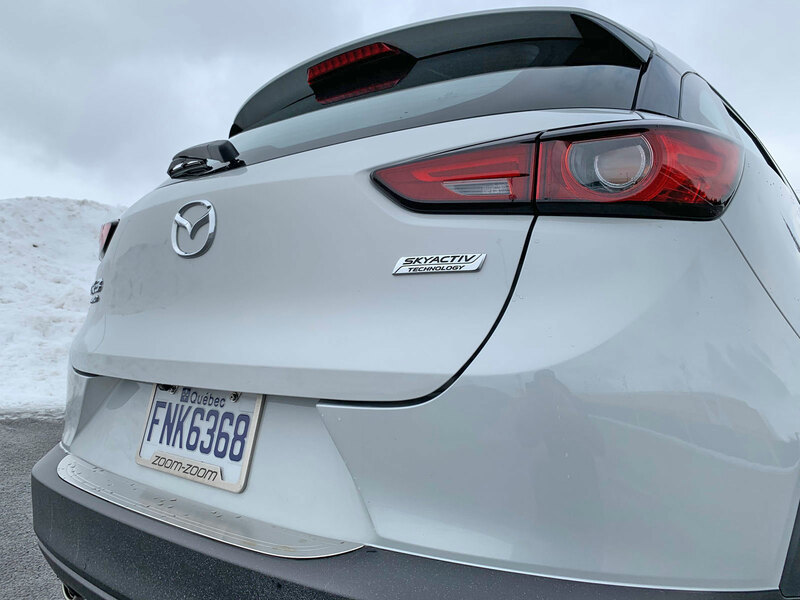 Koodos (pun intended) to Mazda for being one of the only automakers to put it where it should be. For years people have been complaining that Apple CarPlay and Android Auto wasn’t available (and to be honest they were right to complain). 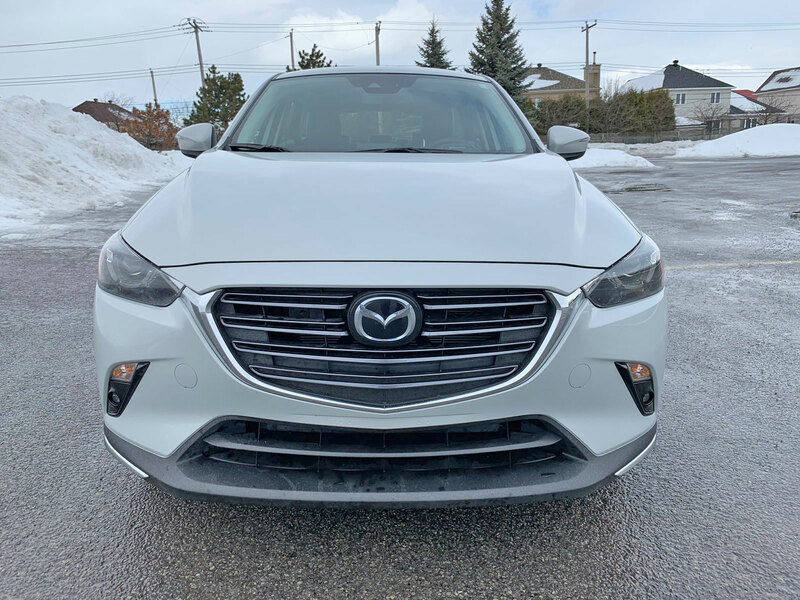 Late last year Mazda finally announced that it had adapted the technology to its system in a way that made sense and would be releasing in in most vehicles. Furthermore, most Mazdas going back to 2014 could be upgraded at the dealership to allow for CarPlay though there is a cost involved. 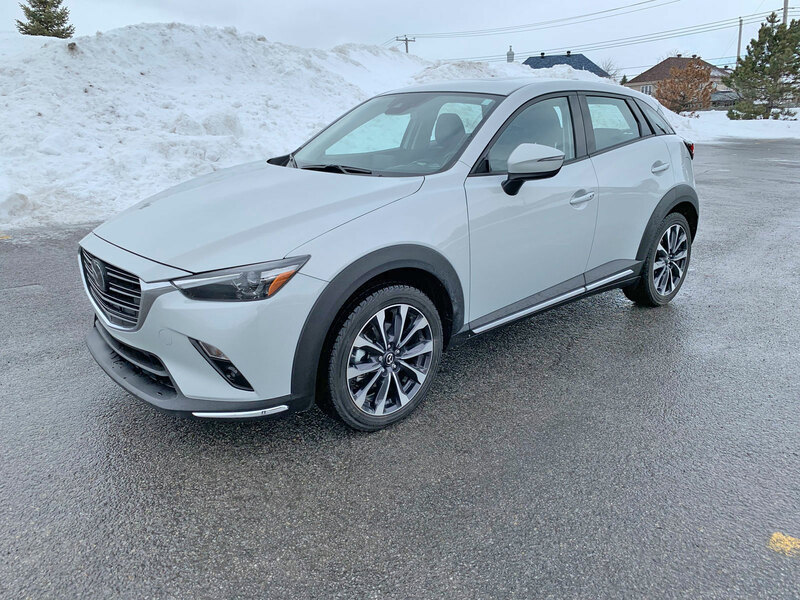 There is a single engine option for the 2019 CX-3: A Retuned SKYACTIV-G 2.0-liter engine with 148 horsepower at 6,000 rpm and 146 lb-ft torque. The engine provides a decent amount of power to move the CX-3 around town. At no time did I feel it was underpowered as has been the case with some other subcompact crossovers. Similarly, the CX-3 handles and brakes very well thanks to it’s lightweight SKYACTIV chassis. 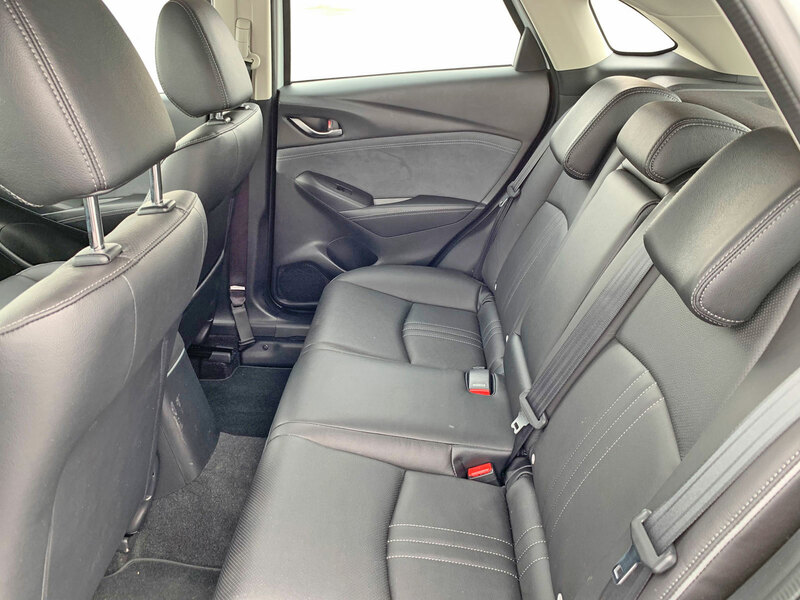 You can get into a CX-3 Sport for just $20,795 though this is the front-wheel drive base model. To get all-wheel drive will run you another $1400. 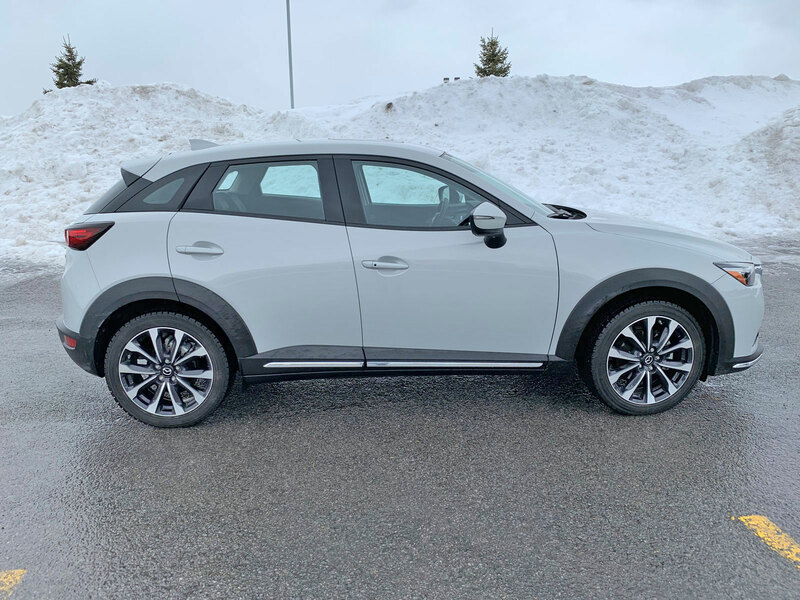 The CX-3 Touring starts at $22,475 and adds 18-inch wheels and keyless entry, heated side mirrors, automatic climate control, rain-sensing wipers, leatherette, three-level heating adjustment for the front seats, a leather shift knob and steering wheel. The high-end GT version you see pictured here starts at $25,745 and adds full-leather seating, chrome accents on the front bumper and side sills, a full-color heads-up display unit, power moonroof, LED headlights taillights, fog lights and daytime running lights, Mazda Navigation and paddle shifters.